Samson Sholademi - LJ user sholademi, journalist of a Russian tabloid Express Gazeta - displays a unique drawing collection on his blog: portraits of Russia's president Vladimir Putin, made by children (mainly). 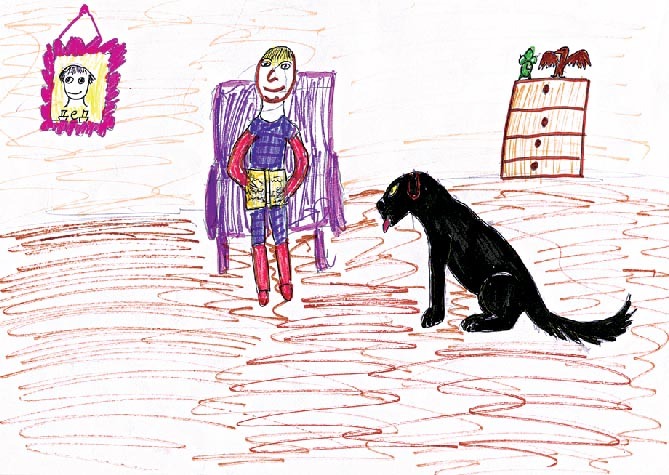 There is Putin "relaxing at home, reading a book to his doggie Kony" (by Vika Lvova, 9), and there is Putin with Kony on a desert island (by Boris G., 11), and there is Putin "always brushing his teeth in the morning, and there's a toilet made of gold in his bathroom" (by Nastya Karpova, 9). 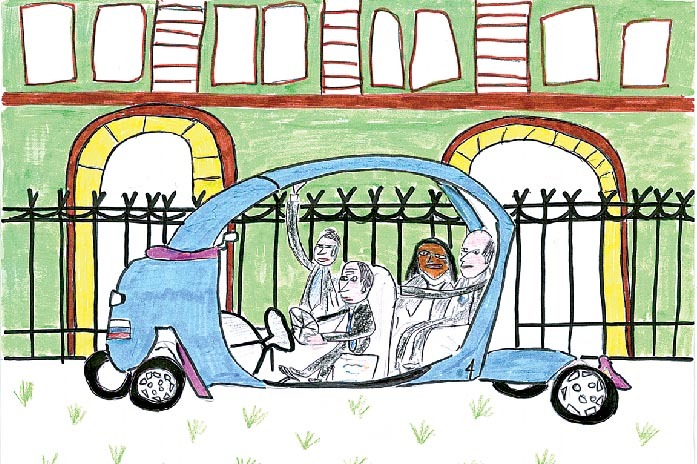 There is Putin driving around with George W. Bush and Condoleezza Rice (by Dasha N., 12), and there is Putin next to the Kremlin Wall, with the Russian flag up and the U.S. flag down: "Russia - forever, America - pfooooo!" 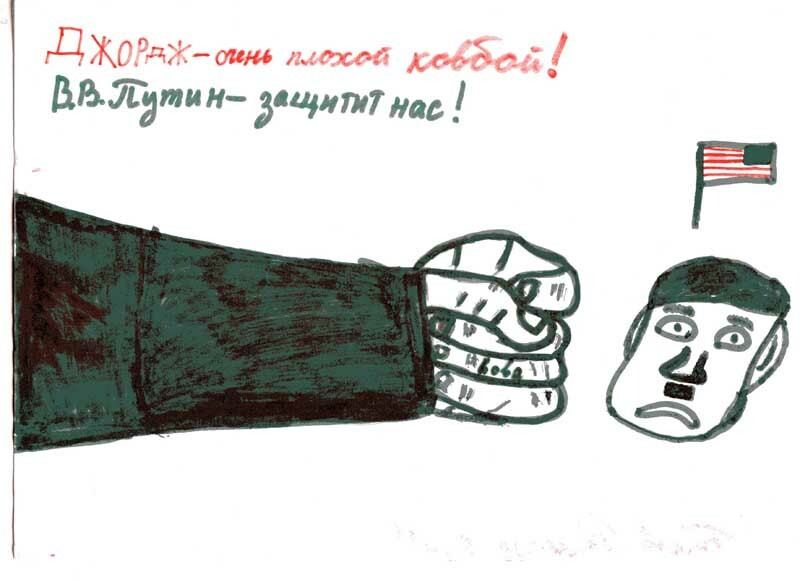 (by D. Petrenko, 11), and there is Putin's fist directed at a head with Hitler's mustache and a U.S. flag above it, with the words: "George is a very bad cowboy! V. V. Putin will protect us!" 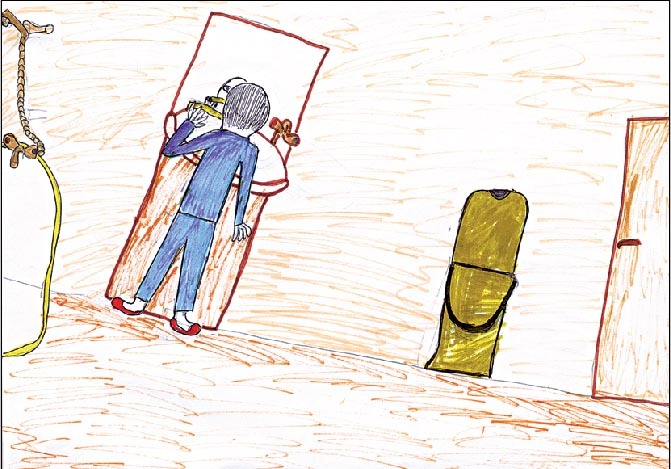 (by Roman Belov, 6-grader). 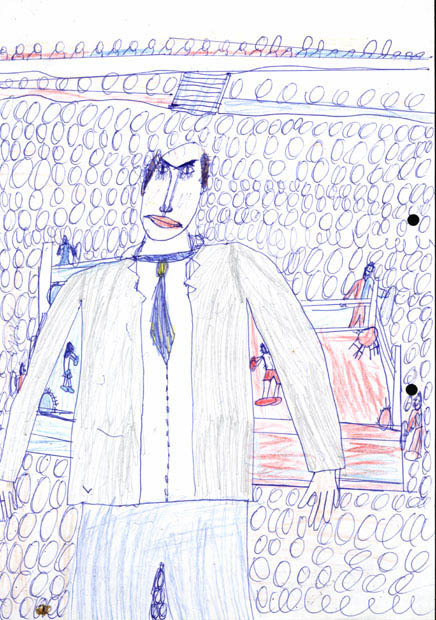 There is a Boris-Berezovsky-look-alike Putin, standing next to a boxing ring, wearing a suit instead of a kimono: the author - Alisa Lukshina, 7, daughter of LJ user agatangel, Kyiv, Ukraine - isn't sure what "kimono" is. 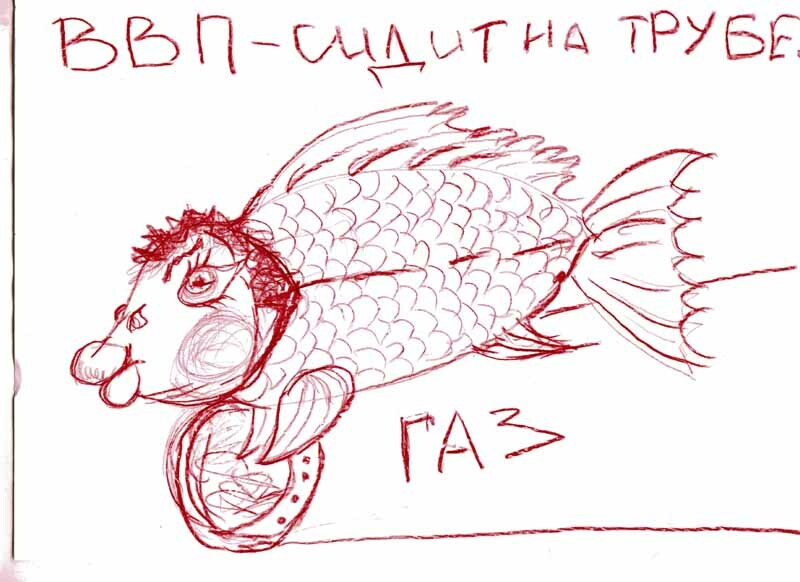 There is a fish with Putin's initials - VVP - sitting on a gas pipe (by an anonymous young man). 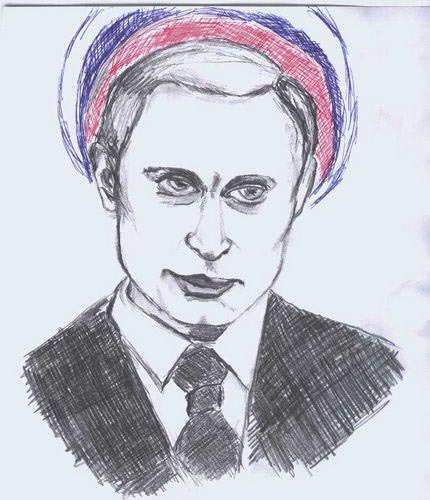 There is Putin with a Russian tricolor halo around his head (by LJ user zhivaya_voda). I was given an interesting assignment at work today: to ask ordinary kindergarten and school kids (grades 1-6) to draw our president - Vladimir Vladimirovich. The way they imagine him when they hear the word "Putin." I've already found a group of school and kindergarten kids for this "experiment." But to be honest, I don't want to limit myself to these two age groups only: from 3 to 6 and from 7 to 12 years old. And geographically, to Moscow alone. It'd be interesting to see how Putin would be drawn by older people and those from other cities or even other countries. That's why I want you, my friends and readers of my LJ, to take part in this competition of amateur drawings called "Kids Drawing Putin." 1. 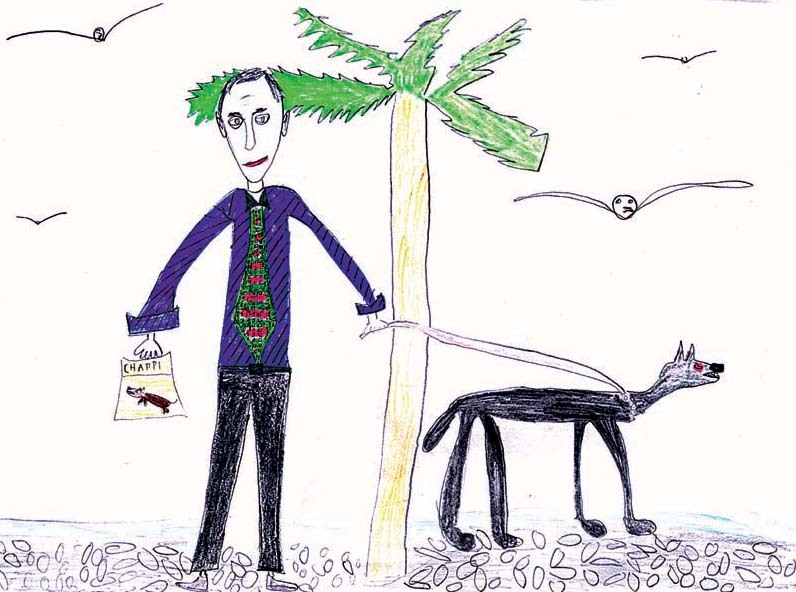 Putin with his black labrador Kony. 2. Putin on a fighter jet. 3. Putin on a submarine. 4. Putin greets the launching of the rocket complex "Bulava." 5. Putin with the Patriarch Alexiy II. 6. Putin with wife and children. 7. Putin with Bush or any other foreign leader. 8. Putin as an intelligence officer. 9. Putin wearing a kimono robe. 12. Putin as a retired man. Some schoolkids, especially first- and second-graders - had a very vague idea of how Vladimir Vladimirovich looked in real life. - How should we draw him, with the hair or hairless? - asked 9-year-old Misha. Opinions differed. Some children thought that Putin does have something growing on his head: on the sides, at least. Others thought that the Russian president is bold. A teacher wanted to clarify at some point, but I caught her just in time with a cautioning gesture. 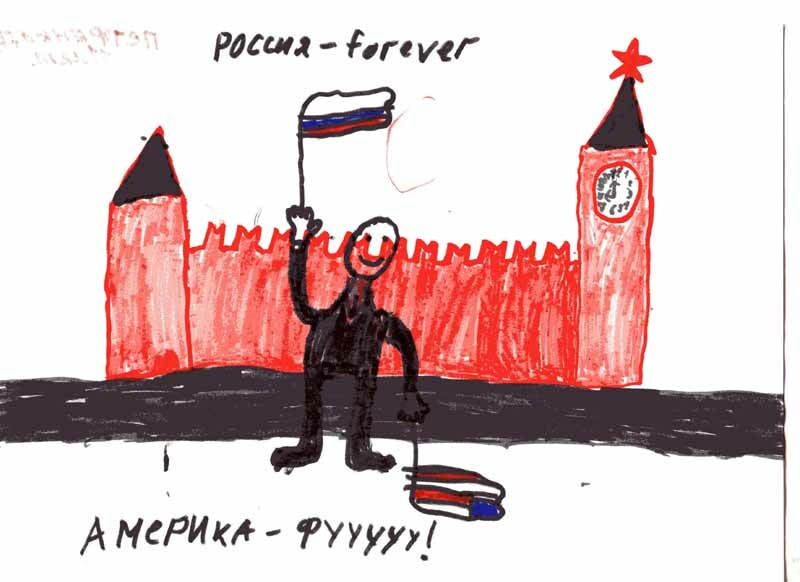 Let each child draw Putin's portrait independently, the way he imagines him, not relying on the adults' advice. This is why girls drew VVP with hair - and sometimes even with a bit too much of it, while boys made Putin look older by leaving a few thin curles on his head. Another issue of contention was the color of the president's eyes: blue or brown? The girls made his eyes the color of the sky; the boys worked hard on painting them black or brown. The newspaper's competition of kids' drawings closes on October 7, Putin's birthday, with an exhibition at the State Duma. Winners will receive prizes; their work will be sent to Putin as birthday gifts. First place: A black labrador puppy - same as Putin's favorite dog Kony. To the winner's parents - a keg of German beer. Second place: A Japanese kimono robe with black belt. To parents - also, a keg of German beer. Third place: A German language audio course for beginners. And a keg of German beer for the parents.